The personal property tax is levied annually on vehicles that are owned in Harrisonburg on January 1. The tax is billed around November 1 with a due date of December 5. The personal property tax is not prorated for persons moving out of Harrisonburg or for the disposal of a vehicle after January 1. It is due for the full year. Vehicles that are normally garaged outside Virginia but have Virginia license plates are taxed by the Virginia locality where they are registered. Passenger cars and light-duty trucks are taxed based on the value of the vehicle. We use the clean trade-in value as determined by the January issue of the National Automobile Dealers Association (N.A.D.A.) Official Used Car Guide. Unusually high mileage as of January 1 may be considered during the assessment process. To claim high mileage, a certified document dated prior to January 1 of the tax year must be presented to the Commissioner's office in order for an adjustment to be made. The personal property tax is calculated by multiplying the assessed value by the tax rate. The current rate is $3.50 per $100 of assessed value. The personal property tax rate is determined annually by the City Council and recorded in the budget appropriation ordinance each year. Owners of personal use vehicles receive a partial deduction on their personal property tax, which is called Personal Property Tax Relief (PPTR), or "car tax relief." The relief is funded by the state, and it varies between localities and may change from year to year. The car tax relief applied to Harrisonburg vehicle taxes in 2018 is 26.4% and is provided only on the first $20,000 of a vehicle's value. Read more about car tax relief [101KB] Personal Property Tax Relief Act of 1998. The following N.A.D.A. pricing guides are also used by the Commissioner of the Revenue office: N.A.D.A. Motorcycle Appraisal Guide; N.A.D.A. Classic Car Appraisal Guide; N.A.D.A. Recreation Vehicle Appraisal Guide. Vehicles not valued by a pricing guide are valued using the original cost less depreciation. 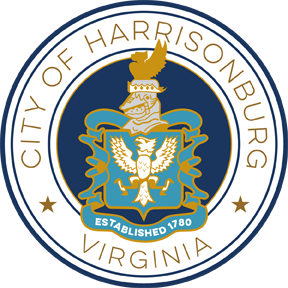 The City of Harrisonburg charges a vehicle license fee for each motor vehicle, trailer and semi-trailer which is normally garaged, stored or parked in the City. This fee is collected with the personal property bill due the preceding year. Get a Virginia State Inspection. I have moved to another state. 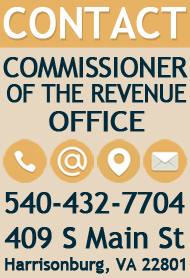 How do I update my records with the Commissioner of Revenue office regarding personal property taxes for my vehicle? Update address, garaged jurisdiction, and date of move with the Department of Motor Vehicles. 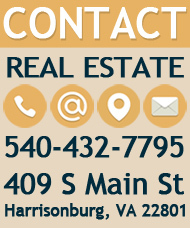 Notify Harrisonburg of your move, so that taxing status can be changed as of the end of the year. *Taxation will cease as of December 31 of current year. Notify the previous locality of your move. *Taxation will begin January 1 of the following year. Taxable in Virginia in home locality: Titled in Virginia, but garaged out of state. Taxable in school locality, unless personal property tax has been paid in home locality: Vehicles titled out of state, but garaged in Virginia. Personal Property Tax Liability for Virginia Vehicles Used by Full-Time College Students. Upon moving, you must notify the Commissioner of the Revenue of your new billing address as soon as possible so that your record can be updated. All billings will be mailed to the last known address on record. Please be aware that failure to receive a bill does not relieve your obligation to pay the tax due by the due date. Failure to pay the tax due by the due date will result in a late payment penalty of 10% or a $10.00 (minimum) being assessed. An annual rate of 4% interest begins January 1 of the following year. Note: If a due date falls on a Saturday, Sunday, or legal holiday, the due date is extended to the next succeeding business day. 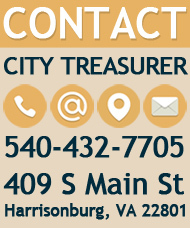 Make all checks payable to the City of Harrisonburg. We do not accept credit card payments in the office. You can only use credit cards, debit cards, and electronic checks through the online system.